Visit Yaeger CPA Review online at YaegerCPAReview.com which started in 1977 with 13 students and grew to become the largest CPA Review course in the Washington D.C. metro area. Yaeger CPA Review is now leading in online CPA courses. Yaeger CPA Review provides cutting-edge learning techniques and always puts the student first. Check 58Coupons for the latest YaegerCPAReview coupons, YaegerCPAReview promotions, YaegerCPAReview sales and YaegerCPAReview deals for YaegerCPAReview.com. College students and recent graduates can save $200 off the full course at Yaeger CPA Review. Click link for details. Take advantage of the free webcasts available at YaegerCPAReview.com. 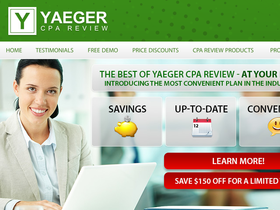 $355 Discount on the Complete Yaeger CPA Review Combo Pack #1 from Yaeger CPA Review. Click Code to Shop Now. $355 Discount on the Complete Yaeger CPA Review Combo Pack #2 at yaegercpareview.com Click Code to receive. $355 Discount on the Complete Yaeger CPA Review Combo Pack #3 at Yaeger CPA Review. Click for Code. $100 Discount on a single section of the Yaeger CPA Review Home Study Course at YaegerCPAReview.com Click Code to View. Get a 25% discount from YaegerCPAReview.com if you took another CPA review or previously purchased their course. Employees of PriceWaterhouseCooper, KPMG, Earnst&Young and Deloitte will save $200 on a Full Course or Individual Courses with Coupon Codes. Click link and choose Discounts to find your firm's code. YaegerCPAReview.com offers a $150 discount to those who used another course without success.